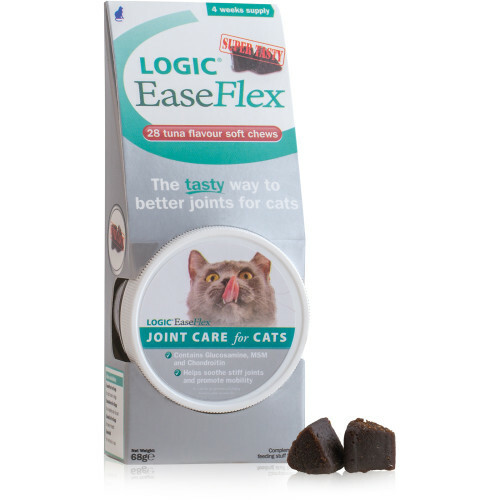 LOGIC® EaseFlex is a super tasty joint supplement that has been specifically designed with concentrated ingredients to help soothe stiff joints and promote mobility in cats. The high quality ingredients in LOGIC EaseFlex include glucosamine HCL, chondroitin and MSM (methylsulfonylmethane). LOGIC EaseFlex should be given daily as a treat and is available in packs of 28 tuna flavoured soft-chews for four weeks’ supply. LOGIC® EaseBall contains natural fish oils to lubricate the digestive tract and enhance the passage of fur through the gut. This reduces the occurrence of hairballs and can contribute to a healthy, shiny coat. For reduction of hairballs, feed one super tasty chew per day. To assist in removal of existing hairballs, feed up to four chews daily until resolved. 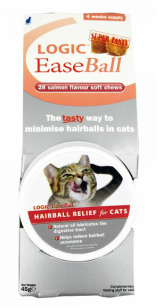 LOGIC EaseBall is available in packs of 28 salmon flavoured soft chews. Chemeyes Pancreatic Enzyme Supplement is used for cats diagnosed with EPI (exocrine pancreatic insufficiency). This disease is usually a rare consequence of chronic pancreatitis. It leaves affected cats with a deficiency in the three digestive enzymes (amylase, lipase and protease) that break down the food your cat eats (carbohydrates, fats and proteins respectively). The supplement also comes in a tub of powder as well as the convenient 100 pot of capsules. It is one of many brands of pancreatic enzyme supplement available but it is substantially more economical than some of the traditional brands. It replaces the three enzymes at the time of each meal so has to be mixed in with your cat's food for life. Potassium Gluconate is a supplement that is used to increase the amount of potassium in your cat’s blood. Cats that are deficient in potassium tend to have underlying illness such as chronic kidney disease. Some cats on fluid-removing drugs (diuretics) for heart disease may also need supplementation as these drugs can wash potassium out of the body. These conditions are typically associated with old age. ​CAUTION! Potassium levels are tightly controlled in the body and subtle changes outside this normal range can cause severe illness of the nerves and muscles. For this reason the supplement must only ever be used if prescribed specifically for your cat and under close monitoring by your veterinary surgeon. Too much potassium can affect your cat's most important muscle - the heart, causing rhythm disturbances and ultimately cardiac arrest. This is the reason it is used for capital punishment in some countries!